I am joining in Cathy’s weekly challenge In A Vase On Monday to create a floral arrangement from materials gathered in one’s own garden. This week I have chosen to feature the native Cornus florida (flowering dogwood). Responding to the week’s sunshine and warm temperatures, the petal-like bracts of Cornus florida (flowering dogwood) are almost fully opened, though the actual yellow-green flower heads, contained in the dense central cluster, remain tightly closed. On Saturday, as I weeded nearby the dogwood, I became more and more aware of its seasonal beauty and I began imagining how it would look indoors. 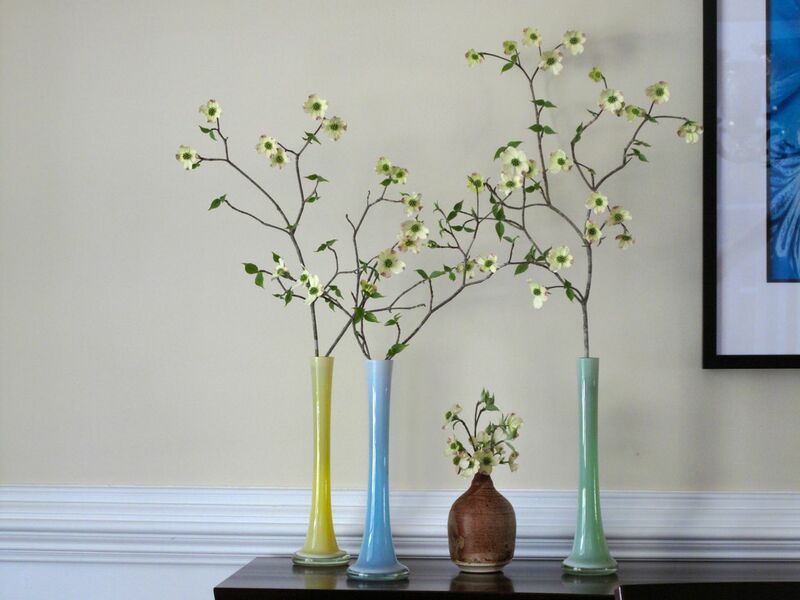 Though I have never cut dogwood for an arrangement before, I thought it might work perfectly in a set of tall pastel vases given me by one of my sisters. I collected three branches on Sunday and assembled the arrangement. Because I needed to trim the three branches further in order to sit them in the vases properly I ended up with some leftover stems. For these I found a ceramic vase with a small mouth that helped hold these remainders straight. The earthy brown glaze and heaviness of the pottery piece contrasts greatly with the shape and height of the three pale-colored glass vases. Though not part of the original design this vase became an important component in the arrangement. 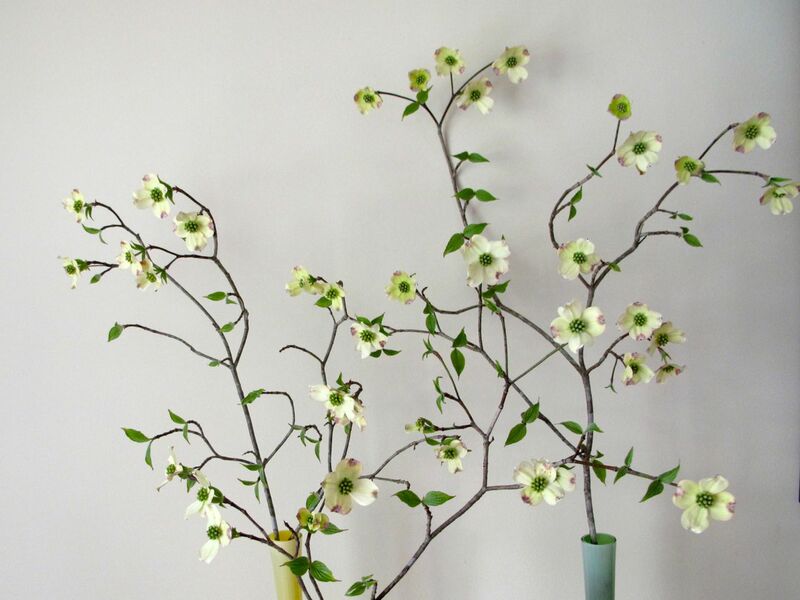 Using branches of varying heights as well as the airiness of the flowering branches themselves combine to create a sense of movement in the arrangement. When I was a child my father instilled in me a fondness for dogwoods by making them the backdrop for family photographs at Easter. He had planted a dogwood in each corner of our front yard and many a spring my sisters and I posed in front of one particular white flowering tree, squinting at the sun in our pastel dresses and white gloves, patent leather shoes and Easter hats. So this week when the dogwoods started filling the neighborhoods and roadsides it really seemed like spring. This entry was posted in garden and tagged Cornus florida (flowering dogwood), flower arranging, flower design, in a vase on monday, memory plant, nature photography on April 14, 2014 by pbmgarden. Thanks Jayme. It’s definitely dogwood season isn’t it? Again you have created such a light airy composition, I love the vases and I agree the dumpy vase emphasises the light elegance of the others. Brilliant. Thanks Christina. I’m happy with this one. The shape of the branches suggested an openness that I tried to reflect. I love the story you have told in your post and that you have used the really lovely vases given to you by your sister. Your arrangement has an oriental feel in its simplicity, its very pretty. Thanks so much Julie. Gardening releases a flood of memories for me sometimes. Thanks, I do admire Japanese style arrangements. A year ago my daughter gave me a book on Ikebana which I was reviewing last week. Maybe I subconsciously incorporated some characteristics. It reminds me of Ikebana too. It is absolutely stunning. I am so envious of the way you can grow such beautiful dogwoods in America. The little dumpy vase balances it beautifully. Chloris, thank you. The dogwoods are indeed special here. At my last house we had many just growing wild and I miss them, especially at this time of year. My current dogwood struggles as it gets a bit too much sun. Waba-sabi. And in the first photo, the picture frame is absolutely necessary for the balance. So happy to learn this word. Thank you. And I appreciate your comment on the picture frame. I felt the frame had to be there too. Again, thanks. I love your arrangement and think it’s lovely how particular flowers or trees can bring back fond memories. The dogwood against the plain background is very effective Susie, and reminds me of Japanese cherry blossom art. Thanks Cathy. I noticed you had a nice dark background for your arrangement today and meant to comment on it. It can be hard to find a good place to photograph the flowers where the background doesn’t become a distraction. My garden is full of nice memories–it’s something I really cherish about the time I spend there. Have a good week. Elegant and so simple – it is stunning Susie! Flowers can bring back memories like nothing else. What an amazing flower that cornus has – and really lends itself it this extremely elegant display. You do simplicity so well, Susie 🙂 And it’s great having the stories behind them too – memories of the cornus from childhood and then the vases from your sister. Thanks as always for joining in! I’ve always loved dogwoods but none of the prettiest varieties, like the one featured in your arrangement, will grow in my area. It makes a wonderful display all by itself and the vases you selected are perfect. I laughed at your description of your family Easter pictures – it reminded me of my own early childhood photos (like the one featured at the top of my blog of my 5-year old self, although I think that one may have been taken at Christmas). 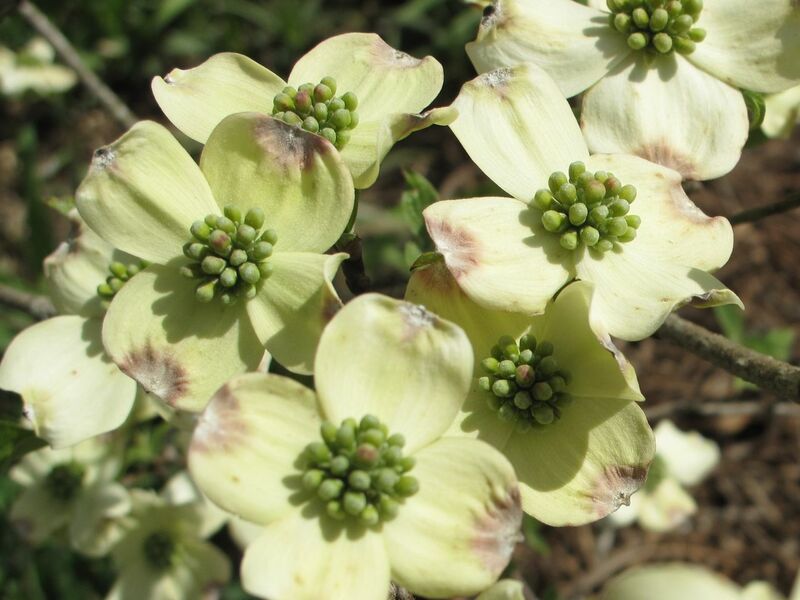 Too bad dogwoods don’t grow in your area–it is a beautiful tree. It’s interesting to me to see the different plant materials you and others are finding each week to include. Glad you could relate to my childhood story. I love that photo of you at five by the way.. Thanks. Glad your dogwoods are giving you a good show. Mine is not really at its best this year and I think it is because it was so wet for so long. The flowers (bracts rather) are very small. What beautiful flowers. They sit so well in all the vases though I think that the short ceramic one is my favourite. 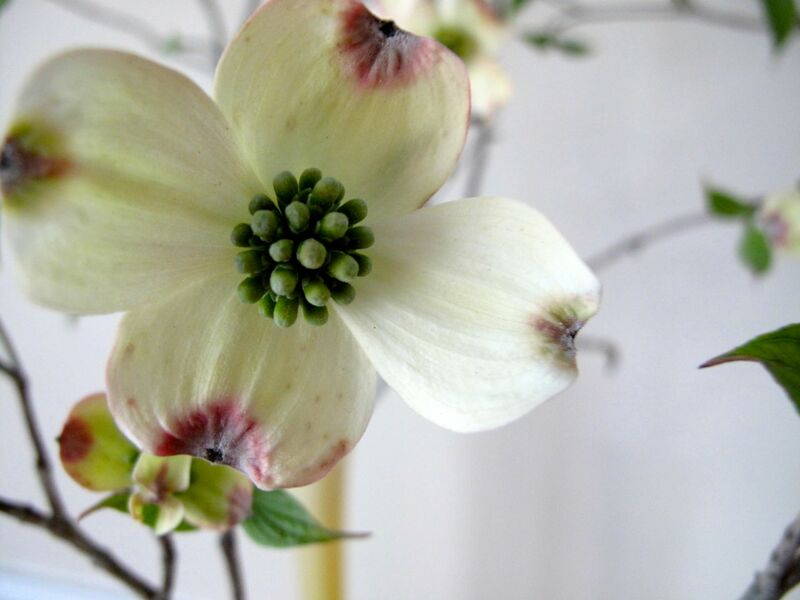 I imagine that dogwoods would provide the perfect backdrop for spring time photos providing the perfect finishing touch for your Eater bonnets. Thanks Anna. The dogwoods did make a nice backdrop for those photos. Can’t blame you. Chocolate eggs, yum! Absolutely beautiful, Susie, and I’m looking forward to seeing what happens if you keep adding another vase each week. 🙂 PS: Ikebana was the word I couldn’t think of the other day. Hi Annette. Thank you! I’ve been known to line up my old vinegar jars along a counter with a few blooms in each one for a big display, so you probably will see more vases at some point. Actually it’s an interesting exercise to come up with an arrangement each week–possibilities are endless. I’ve failed at making arrangements with dogwood, but you’ve done a fantastic job. I always fight the horizontal look but love the way you used it to form a tracery against the wall. and they look even better not fully opened yet. Nice job! Thank you! 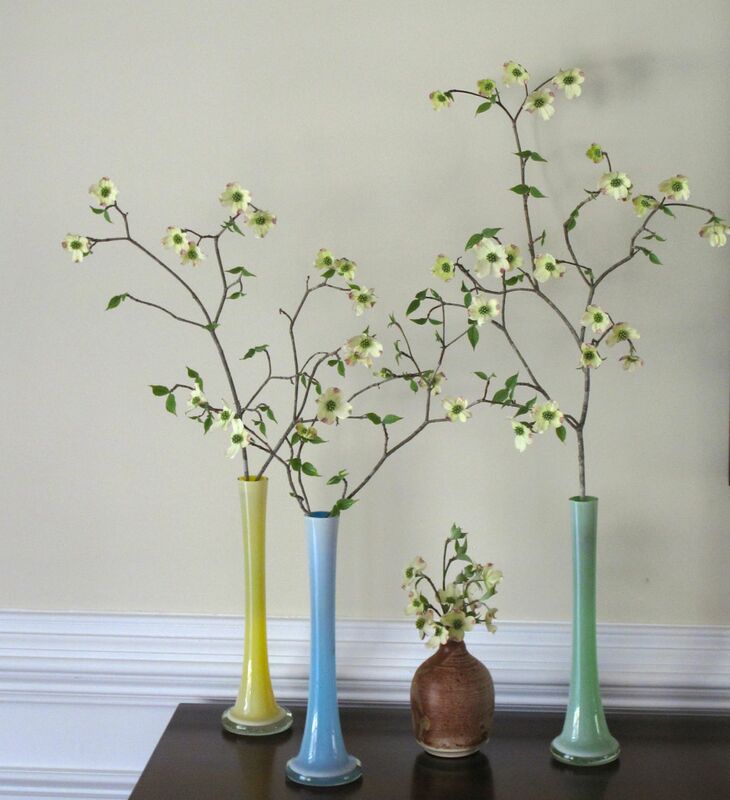 The dogwood branches are so inflexible I had to let them “be themselves.” Try them again sometime–the arrangement has lasted very well this week. Beautiful arrangement. I love your explanations as to how you set it up. I miss seeing Dogwoods. Not really grown much around here, but it was everywhere in NJ. It was one of the first things we planted in our first house. Unfortunately, when I snooped a while back on google maps, it wasn’t there any longer. That was kind of sad. Hi Stephi, glad you liked the arrangement. I can understand how you must miss the dogwoods. Sad to think how places change when we’re not there any longer. My previous house had tons of dogwoods and azaleas and though I much prefer living here, I do miss that property for a couple of weeks each spring. I volunteered at a showcase home this weekend and stood near a dogwood for three hours. What a gorgeous tree. You’ve done wonders with your arrangements. They’re lovely. Thank you. How fun you got to “spend time” with the dogwood. I’ll be working as a guide during a garden tour in a few more weeks. What fun! I’ll look forward to reading about it. 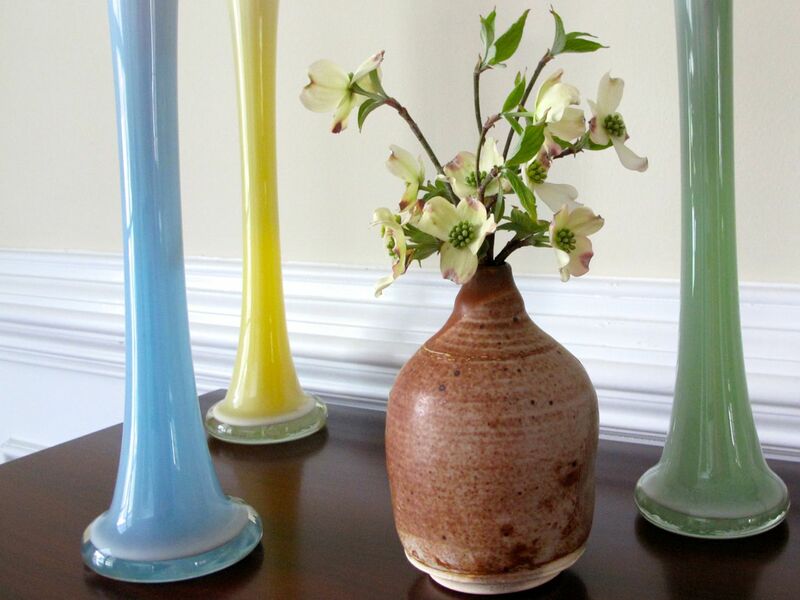 They look lovely in the tall vases….very Zen. Thanks. Those vases are very tall but not very stable so I am happy to have found something that suits them so well. Very pretty! You’ve matched the flower to the vase very well. I would love to try something like this here but I suspect my cat might have other ideas.